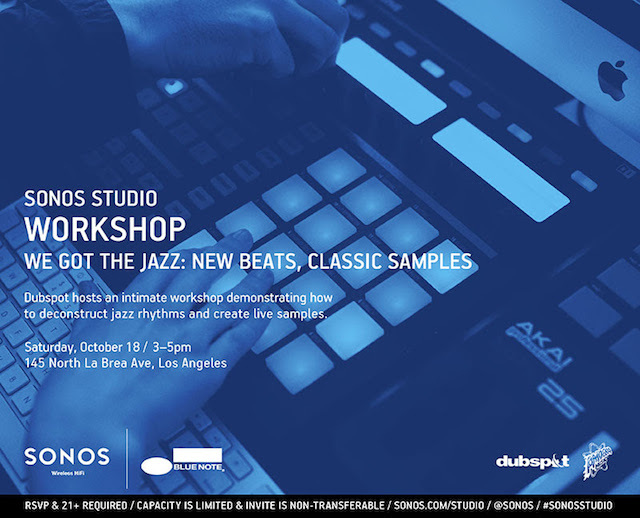 On October 18, 2014 we partnered with Sonos Studios LA for a workshop on sampling classic beats with Dubspot instructor and sampling guru, Mark de Clive-Lowe. In this video recap Dubspot instructor Mark de Clive-Lowe demonstrates how to chop, sequence, and process classic jazz samples from the legendary Blue Note Records catalog to create new beats. Established in 1939, Blue Note Records is the most prestigious label in jazz music whose 1960s to 1970s music was sampled heavily by early hip hop dance music producers. Blue Note played host to artists including Miles Davis, John Coltrane, Thelonious Monk, and countless other jazz music greats. Dubspot hosts an intimate workshop demonstrating how to deconstruct jazz rhythms and create live samples with Mark de Clive-Lowe. Mark de Clive-Lowe is a musician, composer and producer originally from New Zealand, now based in Los Angeles, California. His unique sound is a percussive blend of funk, jazz and electronic music. Mark has performed at music festivals across the world and his collaborators include Lauryn Hill, Jody Watley, and more. Join Mark de Clive-Lowe for our Music Foundations Course at Dubspot LA! Unravel electronic music’s origins, build your chops, learn music theory, and make and play music the way you want. How would you describe your sound? How did you arrive at this point stylistically? Mark de Clive-Lowe : I grew up as a jazz musician with a deep love of hip hop, then jungle captured my imagination followed by house and club music in general. I’ve played piano since I was 4, and got heavily into electronic music production when I moved to the UK in 1998. Collaborating with everyone from Phil Asher to Lemon D, Masters at Work to DJ Spinna, jazz labels like Verve and Impulse to legendary jungle label Metalheadz and everything inbetween gave my formative producer years a really eclectic foundation. I just love music and that’s not something I can define by bpm, genre, acoustic vs electronic or anything else. You’ve collaborated with a lot of big names in music. Why do you think collaboration and relationships within a community are important for a musician? Collaboration is essential. having objective feedback and someone to bounce ideas off is imperative. When we’re creating alone sometimes we can lose objectivity over our own work. It’s also just more fun – you get to have a conversation using creativity instead of words. I’ve been lucky to collaborate with so many of my favorite producers, artists and musicians and there’s been something to learn from each and every instance. I think that now more than ever – with technology being so advanced and being able to make music by yourself without even getting up off the couch – it’s so important to challenge yourself to collaborate. It’s the best way to grow and learn. Read more of our Q&A with Mark de Clive-Lowe here.